For many women, calm and calculated compromise is a major part of career navigation. After months of job searching in an over saturated market, Leah*, a 27-year-old communications professional was offered an entry level position at a PR firm. The short-term contract left her without health benefits and vulnerable to unemployment, but it also offered a chance to prove that her experience and education made her worthy of a career in the industry. “I wanted to prove myself, so I took on extra work and didn’t protest when I was tasked with things like cleaning the office and running errands for other employees”, she says. “I even found a senior employee an outfit to wear to a wedding and helped the CEO pack his things and move outside office hours”. Leah worked endlessly within the bounds of her position - and beyond- to prove that she was a deserving of a permanent position with the company. In the end, her contract wasn’t extended and she was terminated without notice. Many of us have been in Leah’s position, or we’ve watched similar events unfold as not-so-innocent bystanders. Female employees frequently take on workloads that exceed the requirements of their positions, and often, it’s of their own doing in an attempt to demonstrate their professional potential. Most of the time, they are simply doing what it takes to adequately meet the excessive standards set out for them. There’s a lot to be done to breakdown the restrictive and unfair expectations that create this pattern. In work forces where women get paid less, are hired less frequently and make upless that 25 percent of leadership roles globally they’ve got to do more to get ahead – or in some cases, just to keep their jobs. Usually, the social structures that hold up our workplaces centralize the experiences and expectations of men. As a result, people of minorities - women included - have to carefully navigate the workplace in an attempt to be treated as equals and gain recognition for their work. They are burdened with the task of attempting to be efficient, diligent employees who are eager to succeed while maintaining the image and attitude that women are expect to have– polite, compliant and often, passive. However, outstanding work and passivity rarely go hand-in-hand, especially when it comes to working in large teams. As a result, women have to come up with creative ways to have their opinions heard, there work acknowledged and their dedication to the company recognized without crossing boundaries. The result? Overworked, underappreciated and unhappy employees. For generations, professional women have strived to make a mark in their industries while being viewed as the domestic force that holds families and households together. This underlying bias still has an impact today. 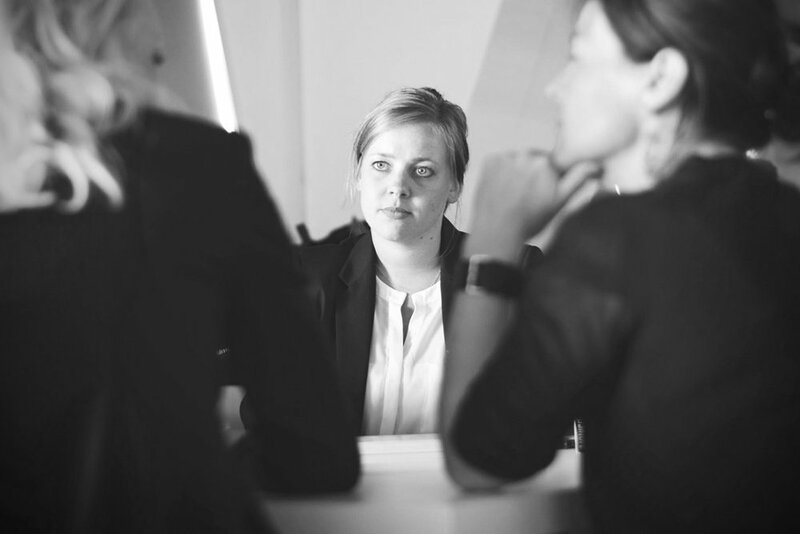 Female employees are often tasked with office “housekeeping” and responsibilities that fall into the realm of domesticity, for example office organization, social planning and hospitality. It’s the legacy of preconceptions like this that put women closer to the bottom of workplace hierarchies that lead to unequal distribution of work. And the imbalance doesn’t end at the office. 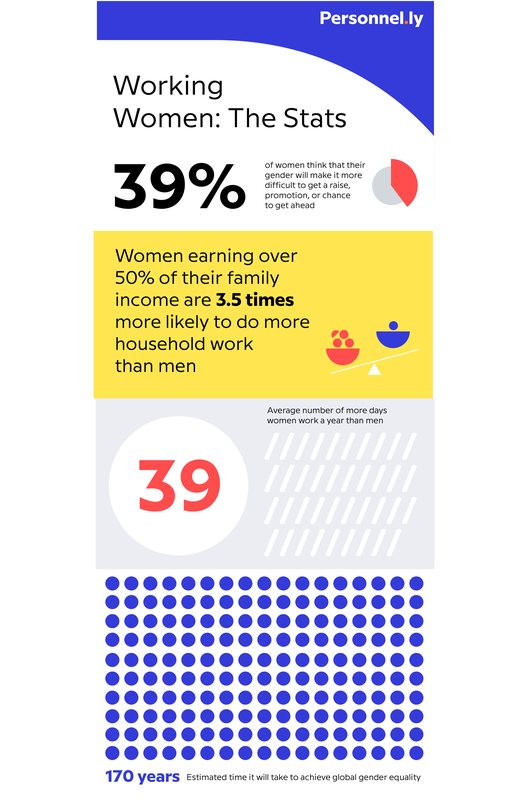 Women earning more than half of their household income are 3.5 times more likely to do more housework than men. Unpaid work like household chores and childcare are just as labor intensive as workplace tasks, if not more. In fact, despite their demanding roles outside of the office, women spend on average 39 more days per year in the office than men. To add to the pressure, female employees must strive to prove that they won’t let family life get in the way of their careers, whether they are mothers or not. In an effort to show that they won’t let pregnancy, school pick-ups or swim practice interfere with their work, many choose to take on even more work at the office. A lot of the biased behaviors that lead to women carrying more weight are subtle and not as easy to identify as you might think. Actions like talking over female employees in meetings, men taking credit for their work or disparaging women for working harder can easily go overlooked, especially if it’s not happening to you personally. However, it’s not just men who exhibit these behaviors – sexism is ingrained in all of us. These unfair standards are occasionally at the core of competitive workplace feuds between women as well. For fair and equitable workplaces to thrive, everyone needs to be aware of their own biases and work to eliminate them. Take notice of employee interactions. Focus on who is leading and hiring and ensure they are trained to identify inequality, unfair behavior and ongoing problems. Task your HR team with touching base with employees regularly and interacting with different teams in their own work environments to get the whole picture. Encourage employees to call out unbalanced workloads or behaviors when they see them, starting with management and senior employees. This works towards making the recognition and acknowledgment of workplace issues something everyone can be comfortable with. Make work-life balance a priority. Ensure that your company offers employees the support and tools needed to foster healthy lifestyles, promote family life and encourage overall wellbeing. Set the same standards for everyone on your team - this is the best way to support people of minorities and to break down the stigmas that hinder the progress of workplace equality. Above all, make your initiative for change evident to your employees. Get them involved, talk about the processes of change your company is going through, and encourage others to get on board. Work collectively towards a more balanced work environment by giving female employees the space and ability to do the work that they were hired to do, and to do it in a supportive environment.